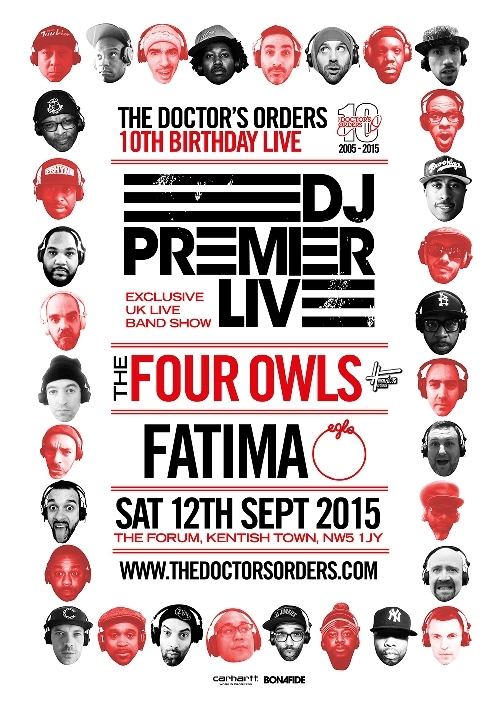 The Doctor’s Orders celebrate their 10th Birthday this year and to mark a decade of bringing many of the best live shows and parties to London they have brought together their most incredible live line up to date with US legends and home grown talent all performing live. DJ Premier is known worldwide as the father of Boom Bap Hip-Hop. One half of Gangstarr and one of the most in demand producers ever. His powerful beats have been used by the likes of Jay-Z, Biggie Smalls, Snoop Dogg, D’angelo, Janet Jackson and even Christine Aguilera. To showcase his work he has put together his very own live band of expert musicians who will be playing his greatest hits live for this their very first and only UK Show. The Four Owls are greater than the sum of its parts. As the headline act of the High Focus Records stable comprising of Fliptrix, Verb T, BVA & Leaf Dog have made bigger waves in the UK Hip-Hop scene reaching millions on YouTube views and rocking shows all over the world. Fatima is the most incredible voice to emerge from the UK bass scene. Soulful, emotional and completely unique her debut album was rightfully chosen by Gilles Peterson as his 2014 album of the year. Along with the Eglo live band she will be delivering a powerful set to make your hairs stand up. To make sure this is party, not just an incredible live show, we also have DJ sets from DJ Premier himself alongside The Doctor’s Orders residents; Mr Thing, Spin Doctor, Mo Fingaz & Russ Ryan.